Mulberry Endura™ Standard size 2-Gang square unbreakable toggle switch wallplate in white color, has rugged thermoplastic construction and flexible design. It measures 5.5-Inch x 4.5-Inch. It has two toggle switch configurations and supports horizontal orientation. This excellent color retention wallplate resists grease, oils, UV light or humidity and solvents. It is suitable for hospitals, schools and other institutional facilities. 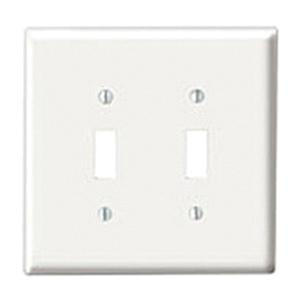 Toggle switch wallplate is UL listed, CSA certified and meets NEC standards.